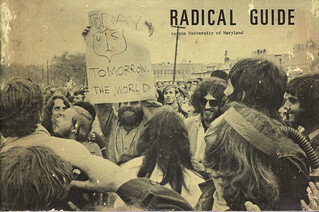 The front cover of the Radical Guide to the University of Maryland shows the occupation of U.S. Route 1 during demonstration in May 1970. Photographer is unknown. Published by the Democratic Radical Union of Maryland (DRUM), September 1970.